In PLoS ONE 2012 e:43992 Kevin Kerr and I reported that most of what appeared to be rare nucleotide and amino acid variants in avian BARCODEs were in fact sequencing errors, based on finding these were strongly concentrated at the ends of the amplified barcode segment. Here I look at the nature of common and rare amino acid substitutions in this same dataset of 11,333 avian BARCODEs from 2,709 species. Do these support our inference that rare variants are mostly errors? I believe the large figure below says yes. 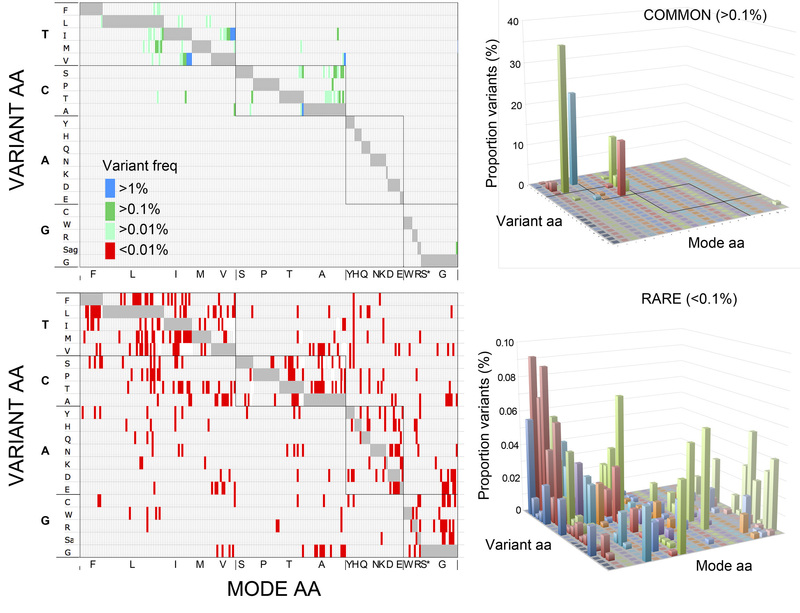 The more common variants (present in >0.1% sequences) are shown at top and the rare variants (present in <0.1% sequences) at bottom. The left shows variants at each of the 216 amino acid positions, sorted according to the mode amino acid (shown in gray) and grouped by codon 2nd position nucleotide. At right, the proportion of substitutions for each amino acid is shown, weighted according to the modal amino acid frequency. The main observation is that common variants are relatively few in number (69) and type (mostly isoleucine (I) <–> valine(V)), suggesting strong biological constraints on allowable variation. On the other hand, rare variants are many (377) and diverse, which is what one would expect if these are largely sequencing errors. A larger version of the figure is here, and the Excel file used to generate the figure is here. I think there is potentially more of interest here in terms of allowable substitutions. For example, Breen et al Nature 2012 490:535 recently demonstrated that molecular evolution is highly constrained by epistasis, such that most mutations are not allowed in a given context, which is presumably what underlies the restricted variation in avian COI. (Breen and colleagues calculations were based on alignments of 2 nuclear and 14 organellar genes, the latter including COI.) In a general way this makes sense–birds can have different kinds of feathers but none have scales like fish. It might be of interest to compare COI amino acid variation in birds to other barcode datasets such as fish or lepidoptera. This entry was posted on Wednesday, November 21st, 2012 at 10:55 pm	and is filed under General. You can follow any responses to this entry through the RSS 2.0 feed. Both comments and pings are currently closed.